Which of these more affordable flagships is the right choice for your next phone? It's hard to argue that 2018 has been a fantastic year for smartphones, and we'd absolutely include the iPhone XR and the OnePlus 6T in the cream of the crop of the last 12 months – both phones combine excellent craftsmanship with some of the best specs you can get. Both phones are also at similar price points (check the widgets on this page for the latest deals): just below the top-tier flagships of the moment, but still serious investments. So which one offers the best value-for-money proposition? We'll help you find out right here. 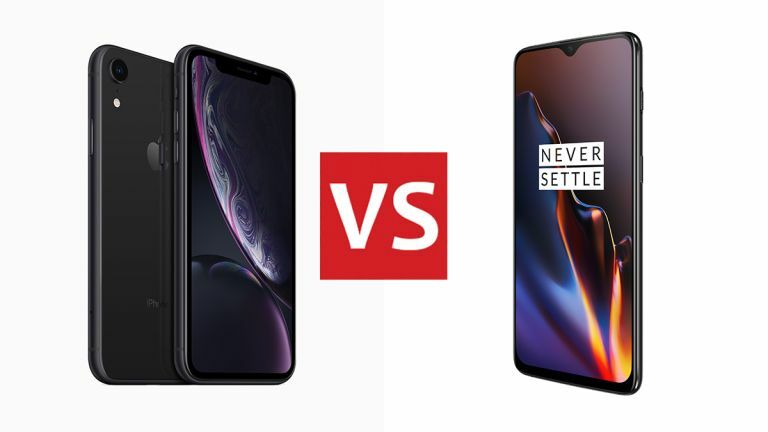 You'd be hard-pushed to find two better looking handsets from 2018, with both the iPhone XR and the OnePlus 6T svelte and slim. The OnePlus phone is bigger in terms of height and width, but it's also slightly slimmer, while the total display area on both these smartphones is fairly evenly matched. The iPhone XR sports a 6.1-inch, 828 x 1792 pixel (326 ppi) LCD display, with glass front and back and an aluminium frame. With five bold colours – black, red, yellow, blue and coral – it's a funkier looking take on the iPhone, though it does share that distinctive front-facing notch with the other iPhones launched in 2018. As for the OnePlus 6T, it features a smaller front-facing notch than its predecessor on a 6.41-inch, 1080 x 2340 pixel (402 ppi) OLED display. Again, there's glass front and back, with an aluminium frame, though this time you've only got three colours to pick from: Mirror (glossy) Black, Midnight (matte) Black, and Thunder Purple. Also of note: a fingerprint sensor embedded in the front screen. When it comes to specs, the iPhone XR carries the same super-fast Apple A12 Bionic processor as the iPhone XS and the iPhone XS Max. The Snapdragon 845 inside the OnePlus 6T is a speedy chip too, but it's the Apple model that has the edge here in terms of raw speed and performance levels. That said, you shouldn't spot any lag on either of these phones for a good number of years. The OnePlus 6T does beat the iPhone XR in terms of RAM, with 6GB or 8GB (depending on configuration) rather than 3GB. You can get the iPhone XR with 64GB, 128GB or 256GB of storage, while the OnePlus 6T offers just 128GB or 256GB. Neither phone has a memory card slot for extending that storage any further. In terms of raw performance, the iPhone XR just about edges it here, despite that minimal amount of RAM. Everything here is very evenly matched in terms of specs though – you can tell these are two of the flagship devices of 2018 by taking a look at the specifications lists. The iPhone XR comes rocking a single-lens, 12MP rear-facing camera that's not quite as good as the one on the more expensive iPhones, but which is still capable of some neat tricks (like Portrait mode for shots of people). The OnePlus 6T goes with a dual-lens 16MP+20MP rear-facing camera, though overall the end results are pretty well matched. One of the major differences between these phones is of course the on-board operating system: you've got either iOS 12 or Android 9 Pie with the OnePlus OxygenOS on top. We don't have room here for an in-depth comparison, but you probably already know whether you prefer the slicker or (arguably) more restrictive iOS, or the more customisable and (arguably) more temperamental Android. At this stage, both OSes are very mature, very reliable, and packed with features. Wireless charging is available on the iPhone XR but not the OnePlus 6T, while the iPhone XR offers IP67 water and dust resistance – the OnePlus 6T doesn't have an official IP rating but can survive a few splashes, OnePlus says. There's lots here to help you pick between the OnePlus 6T and the iPhone XR – for a start, they have quite distinctive looks, so you're likely to prefer one over the other. Then there's the iOS vs Android question, which is probably going to be a big factor in which of these two winning handsets you prefer. As for specs and features, the phones are pretty well matched, and you're not going to be disappointed with speed and reliability no matter which one you pick. Remember the iPhone XR is carrying the same top-end chip inside it as the iPhone XS and iPhone XS Max, so performance should be on a similar level. In one sense the choice here is relatively easy, because these phones have a few key differences: design aesthetics and on-board software. In another sense, it's still difficult, because they're both great phones. Check the widgets on this page for the latest deals, but it's likely that you can get the OnePlus 6T for a slightly lower price than the iPhone XR – and that might just tip the balance for you.